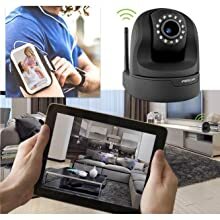 The Foscam FI9826P is one of Foscam's plug and play, 1.3 megapixel indoor cameras with 3x optical zoom, allowing you to physically zoom in on objects with amazing clarity and without losing picture quality. 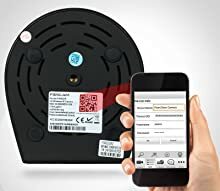 The plug and play feature allows the ability to connect via smartphone by simply scanning the QR code on the underside of the camera. Bypassing the need to access your router and setup port forwarding, the FI9826P can be set up effortlessly by anyone, even those with very little IT experience. The FI9826P features 1280 x 960p video resolution, h.264 video compression, 3x optical zoom, built-in DVR via SD card (up to 32gb), two-way audio, Wi-Fi-N capability, pan/tilt/zoom, remote internet viewing, motion detection, night-vision as well as network video recording capability. 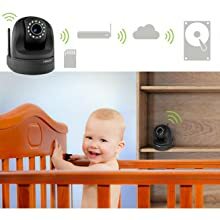 It is smartphone compatible (iPhone & Android App) as well as view able over the internet using standard browsers on PC (Firefox & IE) or Mac (Safari only).The camera functions well as a smartphone baby, pet or elderly parent monitor or as part of a complete home/office security system with remote internet monitoring ability. The FI9826P adopts a high performance media and video processor capable of H.264 video compression which allows for ultra-smooth high definition video. In addition, due to the small file sizes produced by H.264 video compression it has the ability to save tremendous disk space when doing video recording. 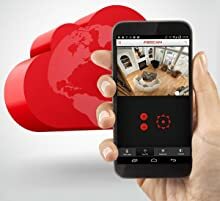 Foscam Cloud provides a convenient way to easily or even automatically back up your snapshots and recordings to a secure offsite server in the event of any threat to your local storage media, such as hard drive theft or damage. Our cloud control app is included (iOS/Android). Because you are never forced into paying subscription fees to use the cameras that you purchase from us, our optional cloud service is fairly priced and available to try absolutely free. The FI9826P is equipped to track even the smallest movements, and the motion sensor sensitivity can be customized to prevent false alarms such as plants or drapes moving in a draft. As soon as motion occurs, you can choose to receive instant alerts of the activity. Unlike less sophisticated surveillance technologies, the FI9826P is therefore able to offer exceptionally reliable, around-the-clock realtime protection. The FI9826P includes high-intensity IR-LEDs that deliver infrared night vision of striking clarity. 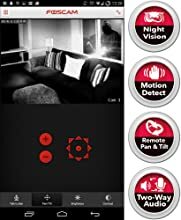 In addition to triggering alerts, motion detection can activate recording automatically. 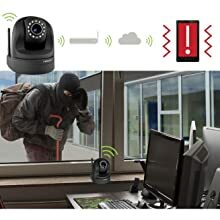 You can even exercise remote control and listen in via mobile app or your PC's web browser: 300° pan, 120° tilt, and 3x optical zoom ensure that when the FI9826P acts as your eyes and ears, nothing can slip past you undetected. The FI9826P is one of our flagship 'plug and play' cameras. The QR code on the bottom of the camera can be scanned with your smartphone's camera using our free app (available on iOS/ Android). This bypasses the need to access your router and configure port forwarding, so the FI9826P can be easily set up by anyone in as little as 60 seconds. The FI9826P can record to an SD card, to your PC's hard drive, and even directly to an FTP server. With an expanded variety of local recording options, which are all completely free, any footage that you capture with the FI9826P is always available whenever and however you need it. Thanks to H.264 compression, you can also store more HD quality footage than ever by saving valuable recording space. 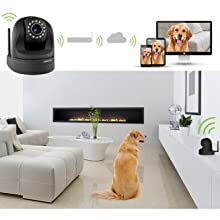 The camera wirelessly interfaces with your home network router which is connected to the internet by your modem. From the internet, the camera's secure video feed can be displayed on any compatible device such as your smartphone, tablet, or PC. The FI9826P also includes extra features such as external audio jacks in addition to its built-in speakers and a MicroSD slot.